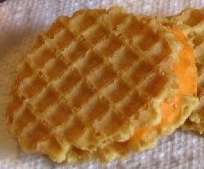 I’m not sure when I acquired this addiction, but I am absolutely devoted to Cheez Waffies. Back in the day, growing up in Illinois, they came in a cardboard tube kind of like Pringles. They were unlike any snack food I’d ever had. The wafers were thin and crispy and the processed and highly chemicalized “cheese” filling was abundant and tangy. And they were hard to find in grocery stores, making them all the more tempting. My mother did not cook much (a blessing, actually) and so she was not at all adverse to bringing what we now call “junk food” into the house. We had Jay’s Potato Chips and sugar cookies from Al’s Deli that were hard as rocks. We had onion dip that my sister and I would steal on Saturday mornings and eat in our closet along with the potato chips. No wonder I was put on a diet at age 8. Really. 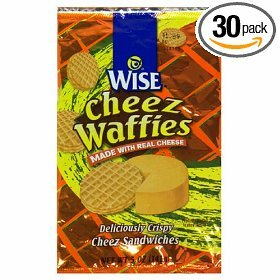 When we moved to Florida, the Cheez Waffies were nowhere to be found. I mourned them. But I went on with life. Then, about ten years ago, my son and I were in a convenience store at Lake Toxaway, in the North Carolina mountains where we have a vacation home. I scanned the chips rack and there they were. Cheez Waffies! I got extremely excited, even agitated. My son, Noah, who was then about 7, noticed this. I quickly bought up a couple bags of Cheez Waffies and opened them right there in the store. My boy. He loved those Waffies as much as I did. Well, to make a long story short, the convenience store closed and there went my Waffies again. Fast forward ten years – TEN YEARS – to a couple of weeks ago when I went to Chicago to pick up my cousin’s car. I was in the Jewel (ever notice that everyone in the South puts a “the” in front of every store – the Krystal, the Publix) and there on a long, plastic clip-on display at the end of an aisle were something called Jay’s Cheez Wheels. I scrutinized the picture on package. Cheez Waffies with a new name, but Cheez Waffies nonetheless. I grabbed three bags and brought them back to Tennessee. Noah ate a whole bag the first night and I actually hid one bag away so I’d have some all to myself. I did something really bad about an hour ago. I’d scoured the grocery stores in Nashville looking for Waffies and this backwater town doesn’t seem to have any. But I found them on Amazon. You had to order in quantity. I did. There is a case of Cheez Waffies, 30 packs to a case, on its way to Albert Drive right now. I know I’m going to regret this. But not tonight.